No 13 on the List for Living! It wasn’t the best of starts. I was on my own in the Arctic Circle. It was cloudy and raining. There was zero chance of seeing the northern lights and and I was stuck on a fishing boat with a bunch of strangers. The plan had been to meet my friend, Vicky in Oslo. We were supposed to travel to Tromso together. But to be in with a chance of experiencing the aurora borealis we needed to get out of the urban area. To somewhere that the sky is properly dark at night so we’d arranged to go out on the boat. But Vicky had a few plane problems and she was stuck in Oslo. It was a disappointing first night all round. This is something I’d wanted to do for years. But it was arranged last minute. A few months ago. We did this trip back in the winter but since then I’ve been too tired to finish writing this. Anyway back to the story. As we’d left it so late it was a nightmare finding a hotel. We ended up booking an austere place near the airport. It reminded me of a Soviet hotel. This was very fitting. Vicky and I became friends when we both worked in Moscow more than a decade ago. The next morning, me and the hotel’s stuffed polar bear waited for Vicky to arrive. I sat in the unnaturally dark cafe and checked the weather forecast. To see the northern lights you need clear skies. Yet while we were in Norway all we had to look forward to was snow and more rain. It felt so frustrating. After more delays Vicky finally arrived. Now our quest could properly begin. Tromso is the most northerly city in Norway. It’s location makes it one of the best places in Europe to see the aurora. That night we had decided to turn to an expert for help. 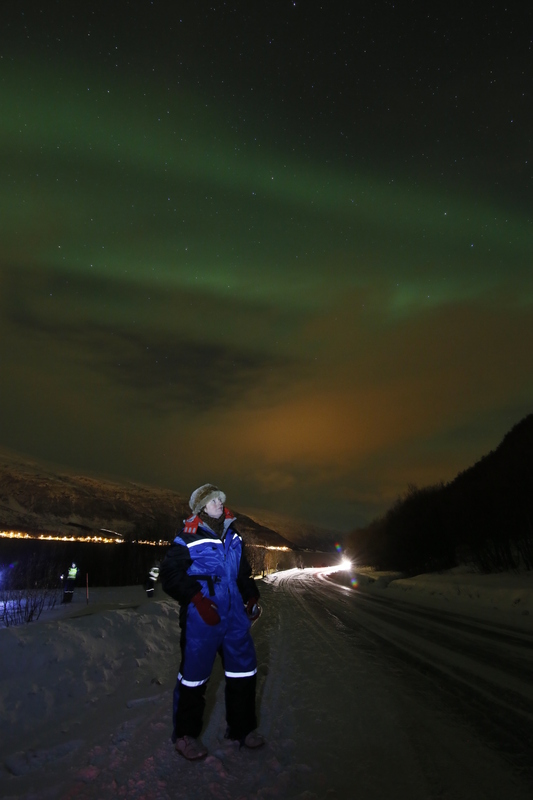 The Aurora Chaser, Kjetil Skogli. He takes you out for the evening in his big car and drives you to the place with the best chance of seeing it. As we left it was snowing heavily. After an hour or so Kjetil stopped the car. We sat in darkness and starred at the sky. It seemed a bit like ghost hunting, trying to make out shapes in the gloomy light. Your eyes played tricks as you peered into the night. Eventually there was something…a break in the clouds. It was like someone had slashed the sky and aurora was oouzing out. It was very subtle. Hardly visible to the naked eye. But my camera could see it. Did this count? Could we say we’d seen them? Technically yes. But we didn’t really think so. The chase continued late into the night. We’d been told to bring our passports and we ended up near the Finnish border. The sky was so dark that the stars were magnificent. Thousands of them. So bright, they didn’t just twinkle, they seem to fizz against the inky backdrop. We’d stopped as there was a very faint smear of northern lights on the horizon. Just above a line of trees. On the other side of us was a mountain range. As we watched and took pictures, our guide laid on a midnight feast of hot tea and biscuits in the dark. Suddenly a wide beam of white light appeared overhead. It was like a rainbow only without any colour. It was amost as if it was coming from a gigantic torch. It rose from behind the mountains and arched through the sky disappearing behind the trees. It was good but to be honest seeing a sky full of stars was much more impressive. It made you appreciate just how incredible the universe is. The cameras were picking up amazing sights that the human eye couldn’t really see. It was a brilliant night but we wondered, was this it? When we were planning this trip to Norway we didn’t want it to just be about the northern lights in case they didn’t appear. The next day we set off into the middle of snowy nowhere for a reindeer sleigh ride. I felt very ill but determined not to miss out. After a few hours sleep on the journey wrapped in my duvet-like coat I’d recovered. When I woke up we were out in the wilderness. By the time we met our reindeers it was late afternoon and already dark. The snow that covered the countryside seemed to glow as our animals ambled across fields and valleys. It was such a tranqil experience. And then there it was. Right above our heads was the aurora borealis!! It was like a thick line of sand in the sky. It was quite straight, bright white, almost iridescent. We had to lie on our backs on the sleighs. The reindeers didn’t take much notice and just plodded on. We stared above us as the line of light changed. Slowly shifting, it formed a V shape. 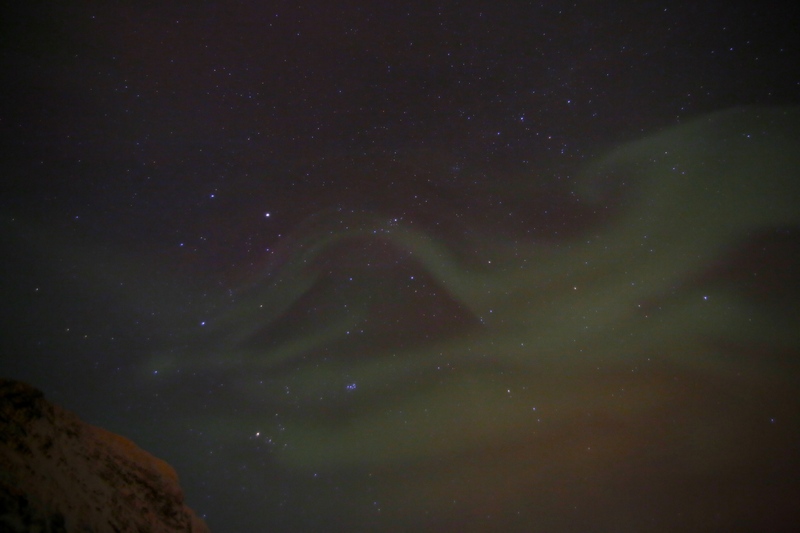 A kind of squiggle and then went into the pattern of waves across the dark sky. It lasted for maybe 30 seconds. It felt very special to witness this. I was so happy that we’d seen the northern lights especially on a night when we weren’t even looking for them. That night we slept out in a communal wood cabin, only heated with a log burner. It was quite basic with no electricity or indoor toilet. Outside it sounded like there was a pack of wolves. But they were just huskies. The following day they were going to be part of our next adventure – dog sledding. I was worried that I wasn’t fit enough to drive the sled so Vicky stood on the back while I sat back on the contraption. It was properly cold but we had special thermal suits, blue overalls made us look like plumbers! Even more snow had fallen overnight so there were untouched deep drifts. The huskies couldn’t wait to start. They sounded as excited as I felt. Racing through the snow, up and down hills, we whizzed through Christmassy scenes of snow covered fir trees. I didn’t care about being out of shape I really wanted a go at driving. Halfway through we had the chance to swap. Most of the time our huskies easily whisked us though the snowy course but I did have to do some pushing when we got stuck in the deep snow. When we got up speed it felt exhilarating and slightly scary. I loved it. It was quite physically demanding but worth the effort and the aching afterwards. It made me remember than this is the real me. That I will, hopefully, be able to do more active things in the future. I felt truly felt alive. Life isn’t about a diagnosis, it’s about the right now. Happy, we headed back to Tromso. For our last night in Norway we’d a booked a good hotel. But we were only there for an hour or so before we were back on the road, chasing the northern lights one last time. More boiler suits, high vis waistcoats and a load of strangers all united by the hope of seeing something. 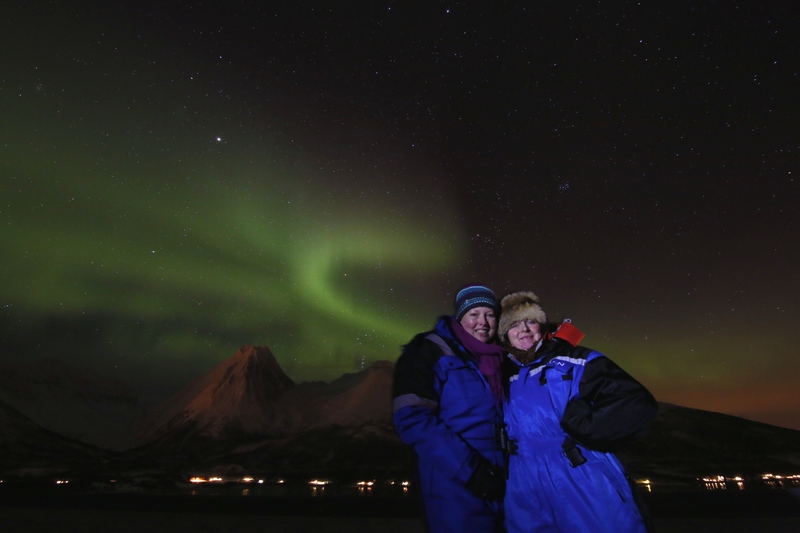 This time we were on the Marianne’s Heaven on Earth Aurora Chaser Tour. We set out at 5pm. Already dark, it was freezing and only going to get colder . I know I wasn’t the only one who felt like we must be slightly crazy to go to such lengths. As we drove the snow fall was so heavy that it pelted the windscreen. I wondered why we were bothering. Our first stop was in a lay-by. We’d driven so far that we’d left the snowstorm behind. Our sights were set on a mountain which overlooked a traditional wooden cottage. 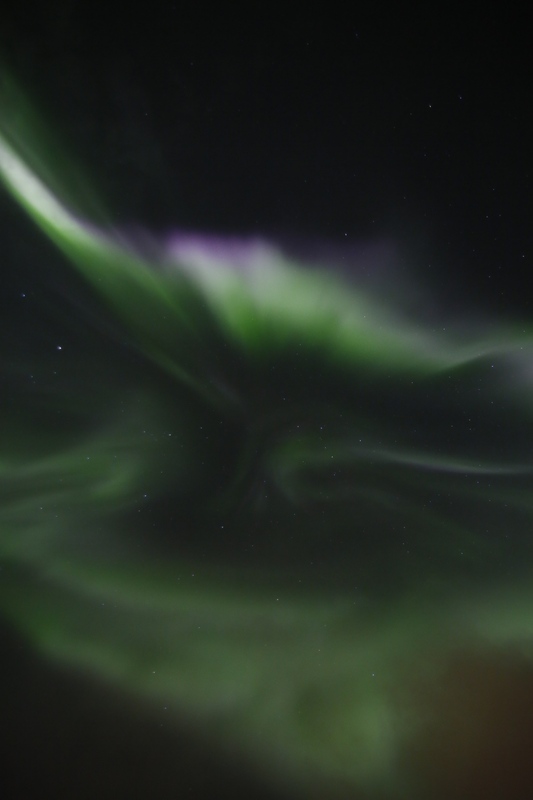 It had smoke twirling out the chimney with a slight aurora plume behind it. Yay it was the northern lights! It was great but not too impressive. I wanted more than just smudges which seemed like a hint of something and nothing. 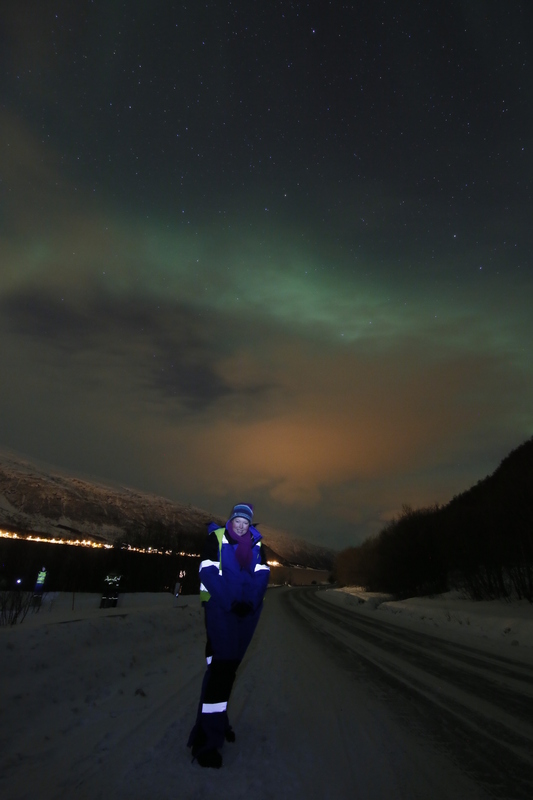 As the evening turned into night, we pulled off the main road next to a fjord. Mountains surrounded the water. But I didn’t notice the sound of the waves all I heard was one of guides shouting at us. And sure enough, there they were! On the last night of our trip we’d got to see the full glory of the northern lights. It was spectacular to watch the aurora dance for us. The glowing lights weaved and morphed, you could see shapes and delicate patterns. The white light, with hints of pink and green became stripes in the sky. The lines turned and twisted. Sometimes melting into waves. At one point I was transfixed by what seemed like a jagged cloud of aurora dripping light, almost like a shower of stars, then it seemed like someone had turned a light on behind me. This was another northern lights show starting and it was so bright it lit up much of the sky. This is what I imagined when I was writing my List for Living. It was just glorious and went on for about an hour, Vicky and I had time to pose for photos, laughing at our safety first outfits. I took many pictures but I didn’t just snap away. Some of the time I stood and smiled at the show. What we experienced was more than just ticking something off a bucket list. It was about appreciating the incredible beauty of nature. While I may never beat the cancer it made me feel so alive and filled with joy. Now that all would have been a fantastic and we would have gone home delighted. However the people leading the group were very passionate. They were convinced there was much more to see. Before heading any further though we had a midnight BBQ near to a forest. Yep, we sat around a campfire in the snow. The northern lights streaked above us in ghostly white shapes. Swirling in the freezing air as we huddled near to the flames. And so our travels continued and we were rewarded with such wonderful scenes. We saw the aurora again and again. Every time we stopped there was a different dance. At one point majestic jets of lights formed white rainbows from one mountain peak. Then there was the most impressive sight of all. By this point it was the early hours of the morning and the temperature had dropped to -15c. Vicky and practically everyone else were too cold to leave the minibus but I made Vicky get out for this one. It was almost like there was a volcanic eruption of light. What looked like bright clouds rushed down the edge of steep, snowy slopes across a lake from us. 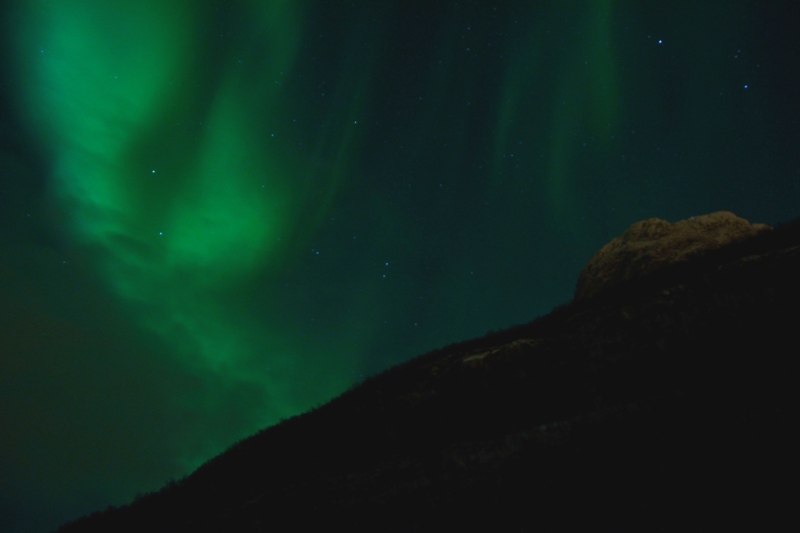 When they reached the ground the northern light sprang back up into the air. Creating mesmerising circular shapes in the sky. This was one of the most amazing moments of my life. It was around 4am when we got back to our hotel. Exhausted but so exhilarated that I could hardly sleep. The northern lights seemed to be imprinted on my eyes. Even when I closed them I could still see the glow of the aurora dancing away.